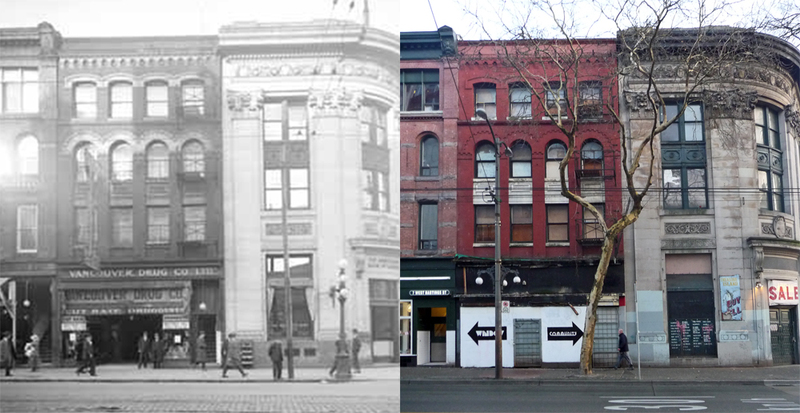 The fancy stone clad building at the corner of Carrall Street and West Hastings Street today has been there just over 100 years – the Merchants Bank was built in 1912. The red brick building next door pre-dates it. The official records say it’s from around 1904. There’s a photograph with a suggested date of 1898, with the edge of the four storey building at 5 West Hastings just showing, but Street Directory records suggest that is a bit too early. We think this is a building designed in 1899 and completed some time during 1900. And we believe we may have identified who built it, and designed it. In January 1899 The Province newspaper announced that on Hastings Street, near Carrall Street, G W Grant would supervise the construction of a four storey block for B.B. Johnston & Co. There are insurance maps published by Charles Goad and Co available for Vancouver in 1901, and they identify the number of floors for every structure. Checking those maps, there are no other buildings shown at four storeys on Hastings Street on either side of Carrall Street – just this one. While today the building to the west is 4 storeys, it started life as a 3 storey building, and we have a photograph of it to confirm that. Although not immediately obvious as a G W Grant design, looking at the Ormidale Block which is also on Hastings, designed by Grant a year later, it’s possible to see a number of similar design elements and almost identical brick and terra-cotta detail. We’ve recently identified Mr Johnston as the co-developer of a building lost to the construction of the Pacific Centre Mall. Here’s an early description of his life. “Mr. B. B. Johnston is a native of Toronto, where he received his early education in the schools of his native city. After leaving school he entered the mercantile agency office and subsequently published The Mercantile Agency for the city and country. This he conducted successfully until 1881, when he removed to Emerson, Manitoba, and engaged in real estate. Here he was very successful in his operations and accumulated considerable wealth. He took a prominent part in the upbuilding of the gateway city, was a member of the council, serving one term and declining a re-nomination and was also Justice of the Peace for the Province of Manitoba up to the time of his departure for Vancouver, in 1889. 5 West Hastings was first occupied as a lodging house around 1900 with Mary Gowdy in charge. She was aged 45 in the 1901 census, was head of the household, had four children at home aged 17 to 26 and seven boarders (including a 15 year old and a couple in their 30s, Nora and Samuel Woods – apparently he was American and a hairdresser). She was born in BC in 1856 but we haven’t managed to trace her in the 1891 or 1881 census records. In 1905 Mrs Caroline Tyler is running the rooms; in 1907 W R Carpenter took over, Mrs Ellen Bullock in 1910 and Lydia Smith in 1912. A year later it became the Drexel Rooms, which it remained into the 1980s – so that was what it was known as in 1920 when our VPL image was taken. More recently it became a Single Room Occupancy hotel called the North Star Rooms, although it has been empty for many years (closed in 1999 for repeated code violations) except for a brief period when it was squatted in 2006.